Can Our Product Work With Your Custom Design? Yes! We understand. You’re a designer and you’ve got a lot to put together. Your new project has a lot of details, you only have so much time and budget is always a concern. You know as well as anyone how much window treatments can assist your overall aesthetic – but they can also be time consuming, tough and, if you’re not careful, they can eat up your budget. That’s when we come in. When you use Drape98– particularly our product – you don’t have to guess, you rarely have too long to wait and it’s reasonably priced. We manage it for you. We do what we can to make it easy and quick. But… will our “in the box” treatments work with your design? It has to look good – it can’t look off the shelf! Yes, we think our drapery, fabric and hardware will match up to any other treatment available and not only that, we think it can also enhance your design! Posted are photos of installations we’ve completed for some VERY talented designers who incorporated Drape98 product into their room designs. 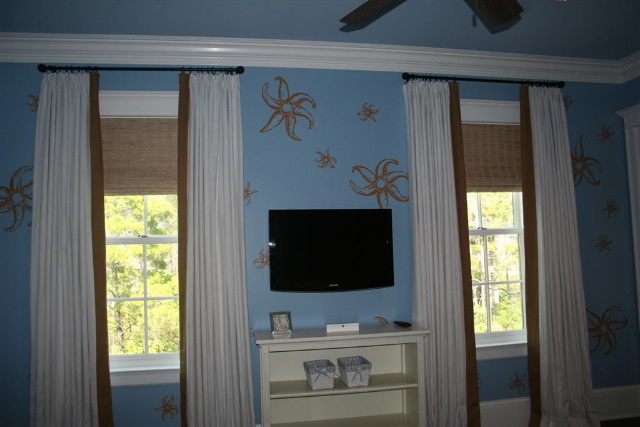 Dale E. Trice principle and owner of Design in Santa Rosa, FL, dressed up a nursery using our window products. We fabricated in Drape98 stock “White” linen and banded using our in stock “Inca” linen. The hardware is ours too. Panels are mounted on our custom, stock bronze rod, rings and capped with our simple, ball finial. Best of all – everything was delivered and installed within 2-3 weeks – So our delivery made “THE delivery”! 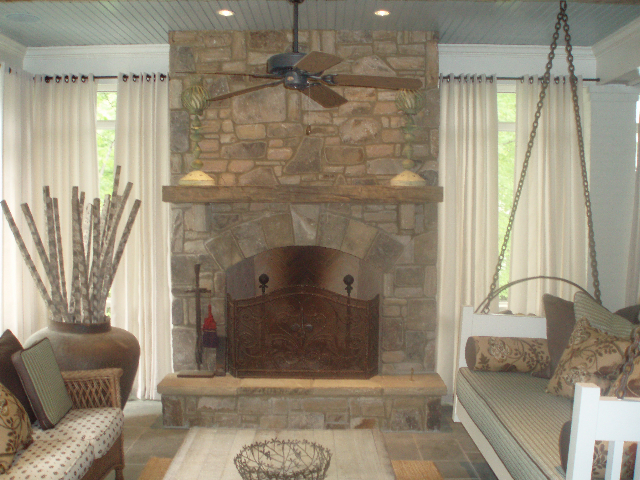 How about this completely custom redesigned home in Nashville, TN? 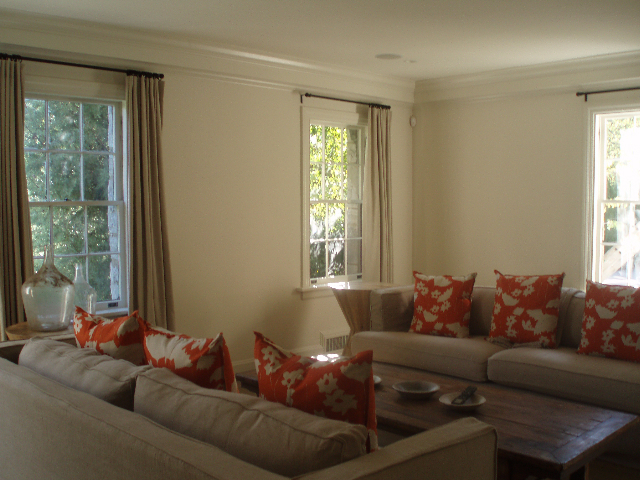 Kay Douglass, designer and owner of the Atlanta’s renowned South of Market, called us to help with this home project because the client wanted a “look” without the price tag and, with lots of details to manage long distance, Kay asked us to take over the window. We handled it all- providing measurements, treatments and installation for the entire house within a 3 week time frame!!! 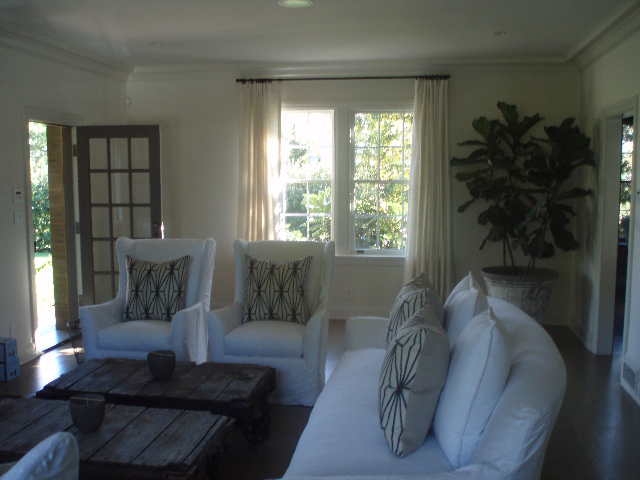 In addition to creating treatments throughout the house, Kay’s design in the living room utilized customer appointed, white linen with Drape98 fabrication and hardware and the den is enhanced by our stock cotton “Tweed” fabric. Everything is strung on our custom Ebony hardware. Her client wanted the porch transformed into another, usable room. We went right to work. You can’t really tell from the photo, but this porch is a large and tricky space, with varying ceiling heights and floor levels. Monica wanted a “continual” rod look, so we designed a hardware system using our stock bronze hardware (outdoor treated) and fabricated bronze gommet panels in our offered “Mist Wren” Sunbrella fabric. The panels help cool in the summer and hold in heat during the winter. As a result, this porch is transformed into a truly magnificent space that has become one of the most used and loved rooms in the house! Client thrilled, designer relieved – done! This screened porch becomes another room - with our outdoor, grommet product! Yes! Our designed product can work within today’s room designs. We have terrific styles that are easy to incorporate into whatever your decor. Our “IN THE BOX” products can work with custom design. What do you think?